Open Tuesday Sunday From 10:00 to 23:00 . Closed on Monday . 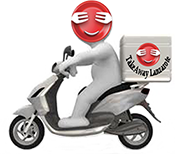 Pizza Delivery Puerto del Carmen - Pizza Takeaway Lanzarote | Burger Takeaway Puerto del Carmen - Meat & Fish Dishes | Tapas - Variety of Food to Takeout Late Night Delivery Puerto del Carmen Lanzarote .